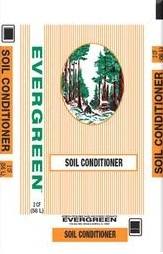 Evergreen Soil Conditioner loosens and aerates soil, promotes deep root growth, and saves water by retaining moisture. It is also a decorative and protective ground cover for your garden, shrubs, flowerbeds and trees. Evergreen Soil Conditioner is great for raised beds and also works well as mulch.